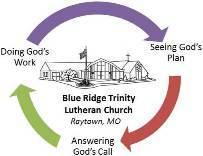 We, the members of Blue Ridge Trinity Lutheran Church ("BRT"), proclaim the message that God's Grace is infinitely inclusive and that everyone is welcome through our doors. We believe that Christ calls us to reconciliation and wholeness in a world of alienation and brokenness. As Disciples of Christ seeking justice and reconciliation among all peoples, we at BRT welcome all into the fullness of God's love. We welcome everyone, without exception and regardless of mental and physical abilities, every gender identity or sexual orientation, whether single, widowed, divorced, separated, partnered or married, any color, culture or economic circumstance and those who feel or have felt excluded or abandoned. We recognize that each person is a unique creation of God and, through Grace, is called a child of God. All are welcome at BRT. All are welcome to worship, to hear the Good News, to receive the sacraments, and to share in fellowship and ministry. As members of BRT, we pledge ourselves and our congregation to exercise our faith in Christ, treasuring one another's similarities while embracing our God-given differences. Adobe Reader is required to download Tidings. To download Adobe Reader click on the icon below.